Superconductors typically find their way into power generation and transmission applications, where losses are unacceptable or great amounts of current are needed to flow. When cooled to a critical temperature, superconductors offer near zero resistance to electrical flow, eliminating heat generation. Additionally, superconductors don’t need to be nearly as robust as standard ambient-temperature conductors. For example, the superconducting cables that are in use at Large Hadron Collider are a fraction of those in use at the previous Large Electron-Positron Collider, both constructed and run by CERN, both able to carry 12,500A. In smaller applications that we might be more familiar with, researchers have been looking into adding superconductors to wind turbines to increase output and efficiency. Even overhead high-tension lines could be improved if research into superconductors yields appreciable results. 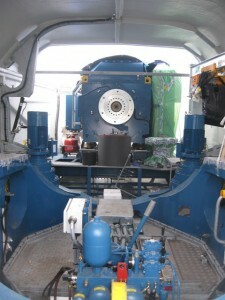 Part of the problem is cooling, which could be difficult in certain applications. Another concern is that even superconductors have limitations to how much current they can carry safely. Research being conducted at the Oak Ridge National Laboratory [ORNL] has yielded a surprising discovery that, by adding defects to the superconducting wire during manufacture, they could actually increase the performance of the completed superconductor. By adding small amounts, on the nanoscale, of non-superconducting material, ORNL can tune the performance of the resulting wire for different applications. ORNL’s new superconductor could revolutionize the efficiency of electric motors and generators. 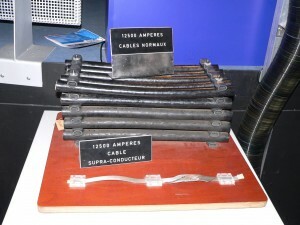 In one test of a superconducting strand, set to run at typical motor/generator operating standards at 65°K and 3 Tesla, the minimum current density exceeded 43.7kA/cm2. This is twice the level of performance for current superconducting wire used in such applications.